“Stop be-bopping” is regarding vertical movement when marching and the “trees in the wind” comment has to do with beginning to march from the position of Attention when a flight or platoon leans into the first step because the Drillers know no other way. Standing Manual: For more info on the complete honor guard (veteran, military, first responder) Standing Manual, see The Honor Guard Manual. First Step: This is the isolated term I began using when working with Vanden High School (Fairfield, CA) Marching Band and continued to use when we moved to Germany and I was an instructor with the Spangdahlem Air Base Honor Guard. I say “isolated” because the military drill world, as a whole, hasn’t considered this one small movement that has so much impact on a Driller, team and performance. Stand at Attention using either Method. Push down with the right heel while you- lift the left foot to bring it forward (see Force picture at right). 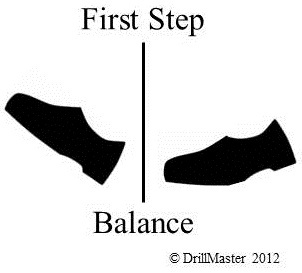 Stop when you are on your right platform (ball of the foot across to the little toe) and left heel; your center of balance should be exactly between each foot with your body centered over it (see First Step picture above). Balance there for a moment (good balance training) to help muscle memory. Repeat as necessary and then begin this exercise: march a few steps, halt, march a few steps, halt. Marching Technique: That’s another article! Great practice for the roll step! I left the Navy almost 20 years ago and still do the roll step as my primary walk. The roll step gives you good bearing and poise and helps you not to “bounce” while you walk! Thanks for the kind words, very much appreciated. Dear sir , I need some videos and web link regarding the marching . This is to teach the grade 4 and 5 children the heal marching for the sports day. If you can help me its good thing. Thanks for contacting me. I have training videos coming, but that doesn’t help you now. So, I looked around and found this video (http://www.youtube.com/watch?v=7Ql0hrMDnw8). Starting at 8:40 this USAF Airman gets into marching techniques. I hope this helps you. 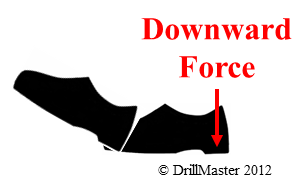 Please stay tuned to The DrillMaster as I will have all kinds of great info coming!